Atopic eczema is the most chronic skin disease in childhood, but Contact Eczema or Dermatitis is much more prevalent in adults. 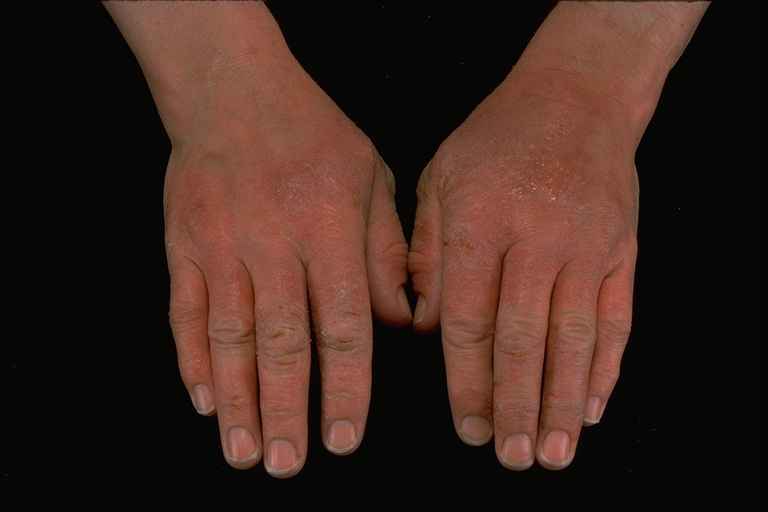 Often affecting the hands and feet, contact eczema tends to come on in adult life, especially if there is a history of atopic eczema. The major sensitisers are nickel, cobalt, the chemicals in hair dyes, fragrances in cosmetics, solvents, hydrocarbons and sweat. But every immune system has its own weaknesses, so triggers vary from person to person. About 5-10% of children with atopic eczema will develop hand eczema in adult life even if they have grown out of their original eczema. This is especially true if they take up certain careers (eg as a hairdresser, mechanic or nurse), that lead to repeated irritation and damage to the hands. The most common treatments for dermatitis are topical steroids - ointments, creams and lotions containing steroid medicines - that work on the skin by reducing inflammation. But these can aggravate sensitive skin if they are overused. In time they can thin the skin and inhibit its ability to fight off further infections. The only permanent cure is to avoid the substance that triggers the condition. For the hands, patients are advised to wear cotton gloves to protect against the allergens and irritants that cause the eczema or to use Gloves in a Bottle shielding lotion if wearing gloves is impractical. Where the feet are affected, again the application of a thin layer of a shielding lotion like Gloves in a Bottle will offer a barrier, and wearing Dermasilk therapeutic undersocks can be very helpful. For eyelids and the eye area, see this page. Nickel allergy, affecting the hands and fingers and other parts of the body, is the most common form of allergic contact dermatitis. For further advice see this page.